Befitting the occasion, there has been the air of a huge birthday party in Ethiopia's capital, Addis Ababa. Tens of thousands crammed into Meskal Square on Sunday to celebrate the 60th anniversary of the birth of the late Jamaican reggae star, Bob Marley. 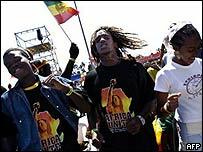 Rastafarians, praising Marley as a prophet, draped their shoulders with red, gold and green flags and many wore T-shirts with their hero's image. They have jetted in from around the world to Ethiopia, which they regard as their spiritual home, coming from as far afield as Israel, Spain, South America and the UK. They mingled with locals to enjoy a free concert to commemorate the life and ideals of Marley, who died from cancer aged 36. Stars such as Angelique Kidjo performed. Marley's life was short but his legacy long. His message of peace, love and unity still has a resonance here in Ethiopia. One Rastafarian from New York said: "I was born in Brooklyn but I'm a Rastafarian and I'm here to celebrate Bob Marley and what he stood for. "He believed in peace and love - it's not all about the ganja and the marijuana." 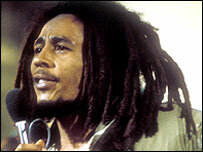 The theme of this concert, fronted by the Marley family, is Africa Unite. It has struck a chord with many of the Ethiopian concert-goers - many hope this event will project a different view of their homeland, a country which is too often associated with poverty and famine. Marley's son, Ziggy, told me Ethiopia was of huge importance to his father as the cradle of civilisation. "This is where all of us came from. That's science, not religious rhetoric. "The message today is that Africa should unite. This is what we're focusing on." So what does he think of the depressing picture of Africa that is so often portrayed? "Those who speak of that are the ones who don't want the vision for Africa to become a reality. But we know its history is great and its future is even greater. "We don't listen to the sceptics or hypocrites who speak against the dream of Africans." And the thousands of people who have turned out here are showing that Marley's message is still potent 24 years after his death.